Maybe Those Are The Mountains of Conroe ? Rudder pursued all four objectives in a speech to the Austin Lion’s Club on August 11, 1955. “ . . . [W]e find in the records of the land office, even in the early days of our Republic, that fraudulent land schemes were widespread,” Rudder told the gathering. In short, if Texas luminaries like Sam Houston or Mirabeau B. Lamar couldn’t completely prevent fraud, modern Texans should not be surprised by its occasional outbreak today. Rudder, however, walked a rhetorical tightrope, knowing that he could not dismiss the crimes of the Giles era as business as usual. Land Fraud in America is an ANCIENT ART FORM – Bank Looting and Sketchy Financing GO HAND IN HAND with the former. The TRUTH IS It was always INSANITY Greg Abbott …. It was INSANE and Very CROOKED from the very start. ESPECIALLY all the UNRECORDED, ILLEGAL, RED FLAG, GHOST, PAPER, WILDCAT, PHANTOM, UNLAWFUL ….. NON BORDER COLONIAS. SJRA’s Executive Director, conducted a briefing for elected officials on Friday, September 1, 2017, at the extraordinarily plush offices of SJRA adjacent to the Lake Conroe Dam. After the briefing, Houston invited elected officials to participate in his video presentation that Houston intended to release on social media. It’s understandable why County Judge Craig Doyal and Precinct 1 County Commissioner Mike Meador would participate in a video wherein SJRA attempted to explain its actions. Doyal and Meador are scions of the “establishment” and seek to fool the public even in the face of obvious catastrophe. Also with Houston during the video were Darren Hess (the County Emergency Management Director who was just following Doyal’s and Meador’s orders) and Lloyd Tisdale (SJRA President). The bizarre participant in the video was Laura Fillault, a Woodlands Township Board member who defeated Bruce Tough in the 2014 election and at least claimed to be a reformer and pro-resident politician. During the Jace Houston video, however, Fillault and Meador were the two participants obviously nodding their heads in agreement with Houston’s bizarre presentation. We have flooding. A major flood still occurs somewhere in Harris County and Montgomery County about every two years. Can You Say MASSIVE FINANCIAL FRAUDS SWINDLES AND CONS ? August 10, 1980 – Hurricane Allen makes landfall near Brownsville as a Category 3 hurricane. A wind gust of 140 mph (230 km/h) is reported in Port Mansfield. Heavy rainfall is reported across South Texas, with a peak of 20.2 in (510 mm) in Kingsville. Nearly all structures on South Padre Island are destroyed. At least 12 tornadoes are also reported as a result of Allen. One damages hangars and aircraft at Robert Mueller Municipal Airport, causing $250 million in damages. Two deaths are directly attributed to Allen, both of which are drownings in the Corpus Christi area, with five others indirectly killed. An estimated $600 million in damages are attributed to Allen. September 5, 1980 – Tropical Storm Danielle makes landfall near Galveston Bay as a weak tropical storm. As it moves inland, it causes severe and widespread flooding across Texas. Areas are inundated by the rain, peaking at 18.29 in (465 mm) in Nederland. One person is killed due to rains associated with Danielle. Mid-November, 1980 – Hurricane Jeanne over the Western Gulf of Mexico causes tides to rise up to 4 ft (1.2 m) above average along the Texas coast. Coastal flooding also occurs, with the worst being near Galveston. Minimal damage is reported. Late-August, 1981 – Tropical Depression Eight moves ashore northeast Mexico on August 29 and into the United States on August 30. As an ill-defined surface low, a large thunderstorm complex forms near its center that day, which unleashes very heavy rainfall in a 50 mi (80 km) wide band covering a 200 mi (320 km) path from Seguin to north of Houston. The highest rainfall amount reported is from Cheapside, where 18 in (460 mm) falls in a 24‑hour period ending on the morning of August 31. Five die in the town of Shiner due to the heavy rains. Heavy rain in downtown Hallettsville causes floods and torrential rain, reaching a peak of 5 ft (1.5 m). Significant flooding also occurs along the Lavaca, Guadalupe, and Colorado rivers in Texas. Damages from the floods amount to nearly $21 million. October 13, 1981 – Hurricane Norma makes landfall on the Pacific coast of Mexico, but its remnants produce 21 in (530 mm) of rain near Dallas-Fort Worth, killing five. Multiple tornadoes touch down in six counties in the region, injuring three. Hurricane Norma causes $50 million in damages and kills three people in Texas. September 11, 1982 – Tropical Storm Chris makes landfall near Sabine Pass. Before landfall the storm causes tides of 5 to 6 ft (1.5–1.8 m) in height. Rainfall from Chris peaks at 0.96 in (24 mm) in Evadale. 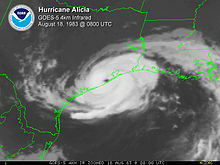 August 18, 1983 – Hurricane Alicia makes landfall near Galveston as a Category 3 hurricane. Alicia causes $2.6 billion in damage and 13 fatalities, along with an estimated 5,805 residential structures either heavily damaged or destroyed. In advance of Alicia, offshore drilling platforms are evacuated. At one point during the storm, the entire city of Galveston loses power, with 250,000 electricity customers in Houston losing power as well. At the time, Hurricane Alicia is the costliest hurricane to impact Texas, not adjusting for inflation. High rainfall totals are reported across Southeast Texas, with a peak of 9.5 in (240 mm) of rain in Liberty. The peak wind gust in Galveston is 102 mph (164 km/h). An estimated storm surge of up to 12 ft (3.7 m) is estimated in Galveston Bay. Alicia also causes 23 tornadoes, concentrated around the Galveston and Tyler areas. August 28, 1983 – Hurricane Barry, a Category 1, makes landfall just south of Brownsville and forces the evacuation of 4,000 people, but causes minor damage. Mid-October, 1983 – The remnants of Hurricane Tico from the Eastern Pacific cause rainfall over much of Texas, most of which are in northern Texas where rainfall peaks at 9.59 in (0.244 m) in Quanah. Numerous road closures take place due to the floods caused by the remnants of Tico. In Val Verde County, 100 people are evacuated due to the heavy rain. Tico’s remnants kill one person and cause $93 million in damages. Mid-September, 1984 – The remnants of Tropical Storm Edouard cause severe flooding in South Texas, where some isolated locations receive totals in excess of 20 in (510 mm). October 11, 1985 – The remnants of Hurricane Waldo produce rainfall over most of West Texas, with multiple rain totals of at least 5 in (130 mm). Late-October 1985 – Hurricane Juan dumps up to 10 in (250 mm) of rain in extreme southeastern Texas, peaking at 12.84 in (326 mm) in Alto, killing one coastal resident. The rains cause widespread floods that lead to road closures, and gusty winds cause some power outages. Coastal flooding is also reported as a result of high tides caused by Juan. June 26, 1986 – Hurricane Bonnie makes landfall near High Island in Southeast Texas as a Category 1 hurricane, killing four people in Texas and producing heavy rainfall that causes street flooding. Rainfall peaks at 13 in (330 mm), with many areas picking up at least 10 in (250 mm). Bonnie also spawns four tornadoes in Texas. August 6, 1986 – A tropical depression produces rain over South Texas with a maximum total of 4.5 in (110 mm) near Refugio. September 23, 1986 – The remnants of Hurricane Newton produce 1 in (25 mm) rainfall totals over the Texas Panhandle with an area of 3 in (76 mm) near the border between New Mexico and Texas, peaking at 3.97 in (101 mm) in Wharton. Early-October, 1986 – The remnants of Hurricane Paine produce widespread rainfall over western and northern Texas, most of which receives at least an inch of rain, with 10.39 in (264 mm) in Wellington. October 22, 1986 – The remnants of Hurricane Roslyn produce rainfall over much of southern and eastern Texas, with the heaviest totals along the middle Texas coast, where rainfall totals exceeds 10 in (250 mm). Roslyn causes low-water crossings and streams to flood. August 10, 1987 – An unnamed storm makes landfall near High Island, Texas, producing over 1 in (25 mm) of rain to eastern portions of the state, peaking at 4.25 in (108 mm) in Umbarger. August 12, 1988 – Tropical Storm Beryl produces heavy rainfall over East Texas. Some areas receive 11.8 in (300 mm) of rain, causing localized flash flooding. September 2, 1988 – Tropical Depression Ten produces heavy rain over Southeast Texas, peaking at 8.16 in (207 mm) in Galveston. September 17, 1988 – Hurricane Gilbert makes landfall in northern Mexico with winds of 135 mph (217 km/h) and causes tides to rise up to 5 ft (1.5 m) above normal. As a result, beach erosion is reported on Padre Island. Rainfall peaks at 7.45 in (189 mm) in Anson. Minor wind damage is reported from Gilbert. Twenty-nine tornadoes are recorded across Texas, with the worst damage in San Antonio. Gilbert causes three deaths in Texas, all resulting from tornadoes in San Antonio. Damages from Gilbert total to $50 million. Late-June 1989 – Tropical Storm Allison makes landfall near Freeport, causing three deaths in the state. Tropical Storm Allison produces torrential rainfall across the state, with amounts of more than 10 in (250 mm) over much of the upper Texas coast, peaking at 20.28 in (515 mm) in Orange. Storm surge from the storm measures 7 ft (2.1 m) in Trinity Bay. As a result, beach erosion is reported on Padre Island. Allison causes an estimated $400 million in Texas alone. August 1, 1989 – Hurricane Chantal makes landfall as a minimal hurricane at High Island, Texas, causing two deaths from flash flooding. Early-October 1989 – Hurricane Raymond from the East Pacific causes rainfall in northern Texas, peaking at 2.80 in (71 mm) in Yorktown. October 16, 1989 – Hurricane Jerry affects the Galveston area as a minimal hurricane. The storm kills three people when a car is blown off Texas Route 87 near Sea Rim State Park. Jerry causes $70 million in damage and kills three. October 3, 1990 – Tropical Storm Rachel‘s remnants affect portions of West Texas. Roads in Big Bend National Park are closed due to high water levels. Rainfall peaks at 1.5 in (38 mm) in Lubbock, causing minor street flooding, which leads to several car accidents. July 6, 1991 – Tropical Depression Two causes isolated rainfall over Texas, with a maximum total of 3 in (76 mm) reported within the vicinity of Anahuac. August 24, 1992 – The remnants of Hurricane Lester, which originated from the East Pacific, cause rainfall in North Texas, amounting up to 3 in (76 mm) in locations and peaking at 3.54 in (90 mm) in Chisos Basin. June 20, 1993 – Tropical Storm Arlene makes landfall near Padre Island. Heavy beach erosion occurs as a result of the storm. Arlene causes $55 million in damage and its flooding rains kill one person. September 14, 1993 – Hurricane Lidia moves into Texas before being absorbed by a cold front near Austin. Lida’s remnants cause moderate rainfall across the state, peaking at 7.3 in (190 mm) in Denton. The combination of the front and the hurricane’s remnants trigger tornadoes, and one causes more than $8 million in damages. Five people are injured in Arlington after a roof is torn off their hotel. Mid-October 1994 – The remnants of Hurricane Rosa cause severe flooding in Texas. In some locations the flood is considered a 100-year event, peaking at 29.40 in (747 mm) in Cypress. The floods kill 22 people and cause $700 million in damages. July 31, 1995 – Tropical Storm Dean makes landfall near Freeport. Dean drops nearly 17 in (430 mm) of rain in Monroe City. The rainfall results in moderate localized damage. August 12, 1995 – Tropical Storm Gabrielle makes landfall just south of the Texas–Mexico border as a strong tropical storm, producing rainfall in southern Texas, peaking at 6.26 in (159 mm) in Weslaco. Slight storm surge associated with Gabrielle floods beaches along the southern Texas coast. September 16, 1995 – Hurricane Ismael‘s remnants move across the Texas Panhandle. Rainfall peaks at 6.57 in (167 mm) in Ransom Canyon, and flash flooding results in the area. August 23, 1996 – Hurricane Dolly makes landfall near Tampico, Mexico. The storm causes beneficial rainfall in southern Texas, peaking at 5.53 in (140 mm) in Corpus Christi, providing drought relief to the area. October 4, 1996 – Tropical Storm Josephine forms just offshore of the Texas coast, bringing heavy rain to the state. Rainfall peaks at 10.81 in (275 mm) in Brownsville. The storm, although remaining offshore, causes severe beach erosion across much of the coast. Several houses are lost and up to 65 ft (20 m) of shore-front property on Galveston Island is eroded. August 23, 1998 – Tropical Storm Charley makes landfall near Port Aransas. Severe inland flooding occurs in Val Verde Country and 13 people are killed. Del Rio records 17 in (430 mm) of rain in 24 hours from the storm, a city record and the most rainfall from a tropical cyclone in Texas since Tropical Storm Claudette in 1979. September 11, 1998 – Tropical Storm Frances makes landfall north of Corpus Christi on September 11 as a moderately strong tropical storm. Rainfall causes large amounts of flooding in southeast Texas and southwest Louisiana, peaking at 21.76 in (553 mm) in Goose Creek. As a result of the rains, many rivers and bayous overflow. Due to the storm, tides are 5 ft (1.5 m) above average. Frances causes an estimated total of $500 million in property damage. Mid-October 1998 – Moisture associated with the remnants of Hurricane Madeline results in flooding in Central Texas. The event breaks numerous rain records in the region, including the wettest month for San Antonio since records began in 1885. In addition, 15 rivers exceed the previously known peak flow. The floods kill 31 people. and cause $1.5 billion in damages. August 23, 1999 – Hurricane Bret makes landfall as a Category 3 hurricane on Padre Island, becoming the first major hurricane to hit Texas since Hurricane Alicia in 1983. As it approaches landfall, large swells cause minor beach erosion along the coast. Along with rainfall from Bret, beaches in Matagorda County are closed due to the high water level. Further inland, heavy rainfall occurs across South Texas, reaching 13.18 in (335 mm) in Sarita. At the height of the storm, power outages cut electricity to an estimated 64,000 customers. Due to the small size of Bret and its landfall in a relatively unpopulated region of the Texas coast, damages from Bret total just $15 million, but it causes four deaths, all of which are attributed to a semi-trailer truck jackknifing in Laredo. September 8, 1999 – Tropical Depression Seven‘s remnants produce light rainfall, peaking at 3.35 in (85 mm) in Harlingen. September 9, 2000 – Tropical Depression Nine makes landfall near Sabine Pass, with maximum sustained winds of 30 mph (48 km/h). Minimal damage is reported. June 5, 2001 – Tropical Storm Allison makes landfall near Freeport. It stalls over eastern Texas for several days, dropping extreme amounts of rain which leads to catastrophic flooding. Allison causes flash flooding in the area, producing widespread street flooding and filling nearby bayous to severe levels. Rainfall peaks at 36.99 in (940 mm) at the Port of Houston. The Texas Medical Center is severely damaged, with losses of up to $2 billion. Patient evacuations and medical services are disrupted due to power outages caused by the storm. Allison causes an estimated $4.8 billion in damages, nearly all of it related to freshwater flooding in the Greater Houston region. Tropical Storm Allison causes 23 deaths in the state, and was the only non-hurricane strength storm to have its name retired until Tropical Storm Erika (did not affect the U.S.) in 2015. August 9, 2002 – Tropical Storm Bertha makes landfall as a tropical depression near Kingsville, causing isolated rainfall throughout the state. September 7, 2002 – Tropical Storm Fay makes landfall near Port O’Connor, where it causes heavy rainfall and $450,000 in damage. Rainfall peaks at 18.49 in (470 mm) in Fowlerton. Fay causes five tornadoes, one of which injures three people. Much of the impact takes place in Brazoria County, where over 2,300 homes are damaged. June 30, 2003 – Tropical Storm Bill causes minor beach erosion on the Bolivar Peninsula. July 15, 2003 – Hurricane Claudette makes landfall at Matagorda Island near Port O’Connor as a strong Category 1 storm, with maximum sustained winds of 90 mph (140 km/h). Claudette is responsible for one direct death. Inland towns in Texas sustain significant wind damage. Estimated damages total up to $181 million. August 16, 2003 – Hurricane Erika makes landfall in the Mexican state of Tamaulipas as a minor Category 1 hurricane, causing minor coastal damage and beach erosion in parts of southern Texas. August 31, 2003 – Tropical Storm Grace makes landfall near San Luis Pass with maximum sustained winds of 40 mph (64 km/h), causing heavy rainfall along the Texas coast and resulting in $113,000 in total damages. September 22, 2003 – Hurricane Marty from the East Pacific makes landfall in the Mexican state of Baja California Sur. Rainfall associated with the remnants of Marty affects western Texas. September 20, 2004 – As the remnants of Hurricane Javier move northeast through northwest Mexico, 1 in (25 mm) of rain is reported in western Texas. September 24, 2004 – Four days after Hurricane Javier affected the state, Hurricane Ivan, having regenerated into a tropical storm in the Gulf of Mexico, makes landfall near Cameron, Louisiana, as a tropical depression. Over 7 in (180 mm) of rain is dropped on eastern Texas. October 10, 2004 – Tropical Storm Matthew moves ashore in southern Louisiana, producing locally heavy rainfall in eastern Texas, peaking at 6.10 in (155 mm) in Matagorda, but little damage. July 20, 2005 – Hurricane Emily makes landfall in Tamaulipas, Mexico, providing rainfall to drought-affected areas of southern Texas. Rainfall peaks at 5.2 in (130 mm) in Mercedes, and is spread from about 1 to 3 in (25–76 mm) elsewhere. September 23, 2005 – Hurricane Rita makes landfall as a Category 3 hurricane on the border between Louisiana and Texas on September 23. In preparation of its landfall, the largest evacuation in United States history takes place, with over 3 million people evacuating inland. At one point during the storm, 1 million energy customers lose power due to outages. Rita causes a peak of 10.48 in (266 mm) in Center. Major flooding is reported in Port Arthur and Beaumont. Offshore oil platforms throughout Rita’s path also suffer significant damage, though the refineries of Houston, originally thought to be at risk, escape the brunt of the storm. Many of the indirect deaths linked to Rita are caused by a single bus fire in mass evacuations out of Houston. Rita causes 59 deaths in the state all told. September 2, 2006 – The remnants of Hurricane John, an East Pacific storm, cause moderate to heavy rainfall. In northern Texas, moisture from the storm combined with a cold front produces rainfall of over 4 in (100 mm), helping alleviate severe drought. September 16, 2006 – Hurricane Lane, another East Pacific storm, makes landfall in the Mexican state of Sinaloa. Lane’s remnants combine with an upper level trough over southeast portions of the state, dropping over 5 in (130 mm) of rain in some locations. August 16, 2007 – Tropical Storm Erin makes landfall near Lamar as a minimal tropical storm. Rainfall peaks in Texas at 10.7 in (270 mm) in Sisterdale. Erin causes nine deaths in the state and causes nearly $49 million in damages. September 13, 2007 – Hurricane Humberto rapidly intensifies before making landfall just west of the Louisiana–Texas border with winds of up to 90 mph, dropping up to 14.13 in (359 mm) of rain. The storm kills one person and leaves $50 million in damage. July 23, 2008 – Hurricane Dolly makes landfall at South Padre Island with winds near 100 mph. A storm surge of 4 ft (1.2 m) is observed across much of the coast of southern Texas. Dolly’s remnants cause coastal and inland flooding and over 12 in (300 mm) of rain in some locations, peaking at 15 in (380 mm) in Harlingen. On South Padre Island, moderate structural damage, mostly to roofs, is reported. Tree and utility pole damage is widespread across Cameron County. Widespread power outages are reported across southern Texas as a result of Dolly. August 5, 2008 – Tropical Storm Edouard makes landfall near Port Arthur with winds near 65 mph. Edouard provides beneficial rain to a drought stricken central Texas. September 1, 2008 – Hurricane Gustav produces heavy rain to extreme East Texas as it makes landfall in Louisiana as a Category 2 hurricane. The storm causes strong rip currents and minor overwash of the coast. September 13, 2008 – Hurricane Ike makes landfall at Galveston as a large Category 2 hurricane. Its large size contributes to a storm surge that is as high as 20 ft (6.1 m), which inundates many of the barrier islands off the Texas coast. Many structures on the Bolivar Peninsula are destroyed. Most notably, in Gilchrist, all but one house is destroyed by the storm surge. The storm also causes heavy rains where it makes landfall, peaking at 18.9 in (480 mm). At one point, the storm knocks out power to as many as an estimated 2.6 million people. Ike is one of the most destructive hurricanes to ever hit Texas and one of the deadliest, causing $19.3 billion in damages and killing 84 people. October 13, 2008 – Hurricane Norbert causes moderate rainfall over West Texas after moving inland from the eastern Pacific. November 10, 2009 – Hurricane Ida causes minimal effects on Texas, producing high tides that lead to road closures. June 30, 2010 – Hurricane Alex made landfall at Soto la Marina, Tamaulipas in Mexico as a large Category 2 hurricane, bringing heavy rains, wind, and tornadoes to South Texas. The hurricane’s remnants also bring heavy rains to portions of the Rio Grande, causing it to exceed record levels. July 8, 2010 – Tropical Depression Two makes landfall on South Padre Island, dropping 1 to 3 in (25 to 76 mm) of rain in south Texas, peaking at 8.95 in (227 mm) in Chincorro. However, there are no reports of damage. September 7, 2010 – Tropical Storm Hermine makes landfall in northeastern Mexico as a strong tropical storm with 65 mph (105 km/h) winds. As the storm approaches the coast, a storm surge of 3.4 ft (1.0 m) is reported at Port Aransas. In the Rio Grande Valley, an estimated 35,000 homes lose power due to Hermine, while in Bexar County, 100,000 energy customers lose power. Farm crops in the Texas Coastal Bend are damaged by the strong winds and rain. In addition, numerous roads are closed due to overwash. Hermine kills five and causes $240 million in damages in the state. June 30, 2011 – Tropical Storm Arlene makes landfall south of Texas near Cabo Rojo. The outer bands of Arlene cause 1 to 4 in (25–102 mm) of rain in southern Texas. July 30, 2011 – Tropical Storm Don made landfall near Baffin Bay, Texas before quickly dissipating. The storm produces minimal rainfall in extreme southern Texas, peaking at 2.56 in (65 mm) in Bay City. Cotton farms benefit from the minimal rainfall. Early-September 2011 – The outer bands of Tropical Storm Lee caused rain in eastern Texas, peaking at 3.97 in (101 mm) in Nederland. Despite the rainfall, strong winds further inland caused by the storm helped ignite numerous wildfires in the state. One of the fires, the Bastrop County Complex fire, destroys 1,700 homes and businesses, becoming the most destructive wildfire in Texas history, according to the Texas Forest Service. August 31, 2012 – Outer rainbands associated with Hurricane Isaac cause slight rainfalls in East Texas, peaking to at least 3 in (7.6 cm) near Galveston Bay. Strong winds associated with Hurricane Isaac’s thunderstorms knock down trees in Trinity County, where wind gusts peak at an estimated 65 mph (105 km/h). September 29, 2012 – Remnant moisture associated with Hurricane Miriam and Tropical Storm Norman brought rainfall over areas of Texas, slightly alleviating drought conditions. Rainfall in the state measures 1–4 in (25–102 mm). The strong rains cause flash floods. Combined with a surface trough, the moisture generates severe thunderstorms which later coalesce into a squall line, causing strong winds which cause numerous reports of window damage. A weather station near Paducah records a peak wind gust of 96 mph (154 km/h). Mid-September 2013 – As Hurricane Ingrid passes to the south, its outer rainbands drop isolated areas of heavy rainfall across South Texas. Rainfall totals from the bands are estimated to have peaked at approximately 3 in (76 mm) near the Texas border with Mexico. September 3, 2014 – Despite making landfall near Tampico, Mexico, the outer rainbands of Tropical Storm Dolly traverse South Texas, producing rainfall totals peaking at 2.91 in (74 mm) in Hidalgo County. After dissipating, moisture from the remnant system causes additional showers in the area. Urban flooding as a result of poor water drainage occurs in Brownsville, Edinburg, and McAllen. However, the heavy rainfall helps to alleviate some drought conditions in South Texas. September 20, 2014 – Flooding from the remnants of Hurricane Odile killed one sheriff’s deputy in Austin. Mid-June 2015 – Tropical Storm Bill made landfall on June 16 on Matagorda Island with winds of 60 mph (95 km/h), causing gusts peaking at 53 mph (85 km/h) at Palacios and Port O’Connor in addition to producing a 3 ft (0.9 m) storm surge at Port Lavaca. However, most of Bill’s impacts in Texas were associated with heavy rainfall. Several isolated areas received in excess of 10 in (25 cm) of rainfall, including a large swath of Victoria County. In Wharton, rainfall peaked at 13.05 in (331 mm). October 20–24, 2015 – Hurricane Patricia‘s remnants brought loads of rain to Texas. The maximum rainfall was 20.87 in (530 mm) in Corsicana. This caused the flooding and closure of Interstate 45 in that area. September 8, 2016 – The remnants of Hurricane Newton brought heavy rains to parts of western Texas. August 25–28, 2017 – Hurricane Harvey, the first Category 4 hurricane to make landfall in Texas since Hurricane Carla (1961), hit the coast near Rockport. To date, the full extent of the week-long impact is unknown. Shortly after Texas won its independence on the nearby battlefield at San Jacinto in 1836, Augustus C. and John K. Allen founded Houston at the head of tide on Buffalo Bayou to be the leading metropolis of the new nation. Sam Houston, elected first president of the Republic of Texas, was honored to have the city named after him and considered the site “far superior” to all others for business and government. The choice of Houston as the temporary capital meant that the Allens got a head start on their goal of making it the Republic’s most important city. Not everyone agreed, however, and the second president of the republic, Mirabeau B. Lamar, moved the capital to the new frontier village of Austin in 1839. It seems, also, that the Allen brothers had exaggerated Houston’s access to the Gulf of Mexico. By the 1850s Buffalo Bayou had silted to the point that only shallow-draft and relatively small boats could reach the city, and the city and county combined efforts to begin dredging of the channel. The Buffalo Bayou Ship Channel Company began work on a deep-water channel in 1870. When Augustus Koch published his bird’s-eye view of Houston in 1873, the city, with its 9,382 residents, challenged Galveston and San Antonio as the most populous in the state, railroads had linked it to the national railroad network, and Houstonians were ready to contest Galveston for preeminence in Gulf shipping. Both Buffalo Bayou and the railroads are evident in Koch’s view of the city, symbolizing Houston’s link between the interior of the state and the exterior world. Viewed from the northwest, the city sprawls southward from Buffalo Bayou, with the shipping terminals for both the railroad and the river boats in the foreground. The bayou is populated with rowboats, tugs, sail boats, and two river boats, the 175-foot long T. M. Bagby and its sister ship Diana, both described as “floating palaces.” White Oak Bayou flows southward into Buffalo Bayou across from the foot of Main Street. The steamboats turned around for their return to the coast by backing into White Oak Bayou. To the east, a locomotive pulls several cars of the Galveston, Houston and Henderson Railway (which is casually renamed here the Houston, Henderson and Galveston) across the new $100,000 drawbridge, while leaving a billowing plume of steam that somehow blows in the opposite direction than that of the T. M. Bagby, nearby in the bayou. Market Hall, which included the City Hall, did not open until May 1874, but it is shown on Main Street (2 on map) and featured in a detail at the bottom of the print. Much like a current-day mall, it housed retail shops, markets, professional offices, and a 1,000-seat theater. Unfortunately, the structure burned just two years later. In most of his views, Koch called attention to the African-American community, and his view of Houston is no exception, as he identifies two churches (although he does not name them): one on Travis (which Koch misspells Traves) Street between Bell and Clay, and another on Rusk Street, near the corner of Rusk and Bagby. After the Civil War, which bolstered the local economy, dredging became a more viable option. The Bayou Ship Channel Company began major dredging operations in 1870, and the city began receiving federal aid to complete the project. This first dredging of the Buffalo Bayou was completed in 1876. When the Allen brothers founded Houston in 1836, they established the town at the confluence of Buffalo and White Oak Bayous. Shortly thereafter, every structure in the new settlement flooded. Early settlers documented that after heavy rains, their wagon trips west through the prairie involved days of walking through knee-deep water. The new settlers didn’t like this natural flooding because it wasn’t conducive to building towns or farming the land. So, they set out to “drain” the land, and to clear it of much of its natural habitat for agriculture or timber for construction. However, there is a big difference between drainage and flooding. The settlers wanted to “drain” the land, which meant they wanted to make the water go away. They did it without any purpose, other than to make the water go away in a reasonable time and to make the channels flow downhill. As the channels got deeper, they also got wider. The early residents didn’t plan with any particular rainfall amount in mind. Harris County doesn’t have earthquakes… doesn’t have blizzards… doesn’t have avalanches. We have flooding. A major flood still occurs somewhere in Harris County about every two years. Most of the flooding is in areas developed prior to the current understanding of flood potential and prior to regulations restricting construction in flood-prone areas. Fortunately, since the 1970’s, there has been flood insurance to ease the financial impact of flooding. Despite tremendous flood damage reduction projects that have indeed reduced the risk of flooding, more flood insurance funds have been paid here than in any other National Flood Insurance Program-participating community. From the Mudflats of 1836 the Allen Brothers and their Dreamtown. … But Houston does have its history, … Happy 175th birthday Houston, Texas!